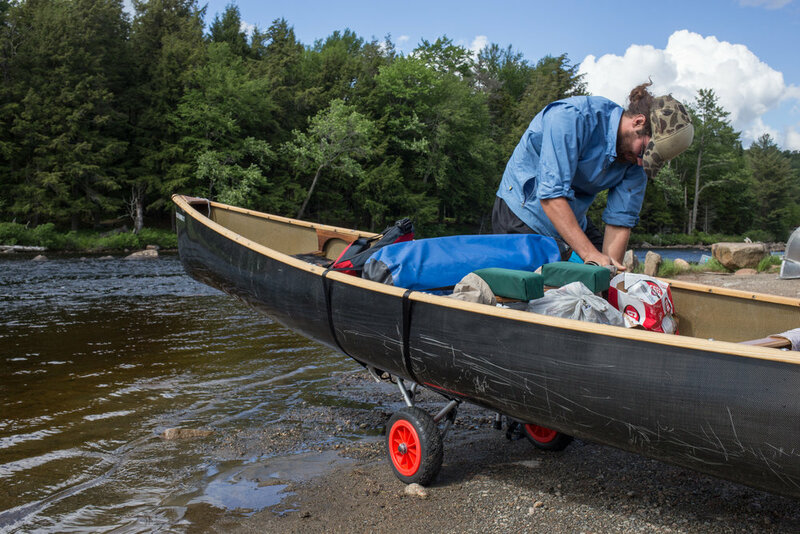 I would be lying to you if I told you that the Northern Forest Canoe Trail is an easy one; that being covered in mosquitoes, dealing with rain for two weeks straight, or portaging a canoe five miles is a cakewalk. However, it would not be a lie If I told you that I witnessed one of the most incredible sunsets along Long Lake. The feeling you have when you rumble your canoe full of gear down unknown rapids and making it to the other side is bitter sweet. When you get your damn canoe on the other side of the portage a party will erupt immediately. This trail starts out fairly easy on a chain of 8 lakes that cut through some breathtaking wilderness areas that very few ever see. It did not hit us how hard portaging truly would be until the third portage, Brown Tract Carry. Not to say we have not hit harder since, but this one laid it on thick for us. Pouring down rain majority of the way and then boom the mosquitoes hit. The very muddy and slippery terrain made figuring out the limits of our canoe cart a pleasurable experience to say the least. I can say with complete confidence that when we put our canoe in on Brown Tract, I immediately remembered why I was here; to slow my life back down, focus on my family and experience a trail like no other. The first week of the trail was almost entirely on lakes or lake outlets. This week has been more rivers and reservoirs. Remember how I said it has been raining the entire time? With that rain comes fast rivers, which is ALWAYS a plus. Tomorrow we start our final swift descent into Lake Champlain via the Saranac River. The Adirondacks have treated us to some beautiful landscapes that I have been dreaming of for years and will be sad to see them go. We are eager for what lies ahead. Looking forward we have a major open water crossing on Lake Champlain with over 100 miles of upstream river paddling. Oh and did I mention a monster 5.7 mile portage? I hope you can imagine the sarcasm in this script, because I assure you if you were to stumble into our camp you would see nothing but happiness, family and maybe a soured face while smelling our unwashed clothes. It is a motto of ours that when the going gets tough, we are at our best. We have come to realize that for one simple reason, we see the beauty in hard work and do not take the reward for granted. See you soon Vermont.